Instantly start a random video call with people from all over the world without registration or sign up or app. 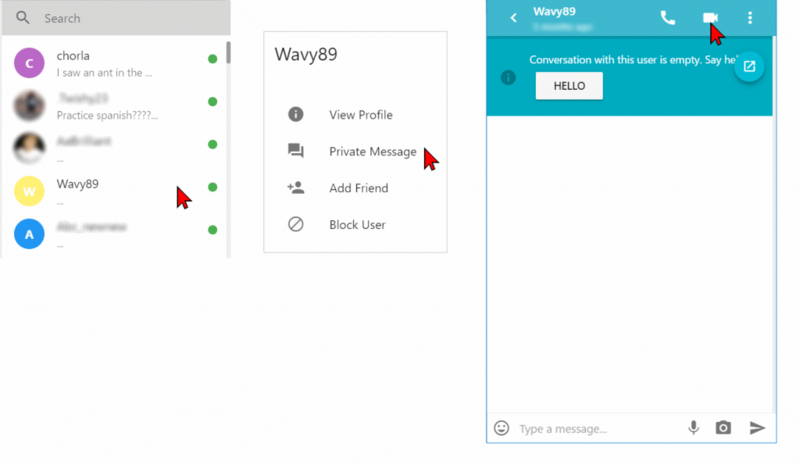 Free guest video chatting with random strangers online becomes a win-win situation at Y99’s chat rooms as you don’t have have to verify your email address or download any app/mod apk to start chatting. You can meet random people online for the purpose of general conversation, improving your English language skills, friendship or even dating. While we might not be the exact alternative to a video chat roulette site or the legendary Omegle, we are an anonymous social video chat room website. That means, it takes just one click to enter the chat and afterwards, you may use the site as a chat room or random chat or audio/video chat roulette or dating site. Whichever way you decide to use the platform, we believe you will be social & respectful to other people on our website. You may click the above “Enter the chat” button to start video chatting instantly on your android mobile/ iphone/ computer. You may also download our random video call app on android/iphone but most prefer calling through our website as it runs smooth on all devices & adapts to all screen sizes. How to make a friend through random video chat? First, join any chat room and ask in the public chat if there’s someone interested in a friendly random video calling session. When you come across interested people, take them to a private chat where you can introduce yourself to them and press the random audio call/ video call button on the top right corner to start the fun. And please don’t stick to the boring ‘ASL’ trend. When you are on a random online video call, it matters very less if you are from Philippines or America(USA) or Malaysia. What matters the most is being cool & nice. Being social & natural and enjoy the awesomeness of random video calling with strangers is the best tip we can give you if you are going to make friends/ random video call dating online. Make sure to never disclose your address, phone number, whatsapp or other personal details to anyone. Wish you all the best! Disclaimer: The examples for random video calling websites referred to in the description (if any) are trademarks of their respective owners and we are in no way affiliated with them. Next Next post: Chatting on Y99 for teens. What is it like?